Pregnancy is a natural state of health and a pregnant woman is seen as “blooming”. In reality many women do have symptoms and anxieties that are not quite so ideal – myself included – and acupuncture offers a safe and effective option at a time when we choose to avoid medication. My post-graduate studies include many courses in the treatment of pregnant women and my dissertation was based on a literature review of the effectiveness of acupuncture in treating nausea and vomiting during pregnancy. Zita West, of whom I am an affiliate practitioner, recommends that mothers-to-be should consider having regular acupuncture sessions as part of a maintenance programme for promoting well-being during pregnancy and in preparation for the birth. 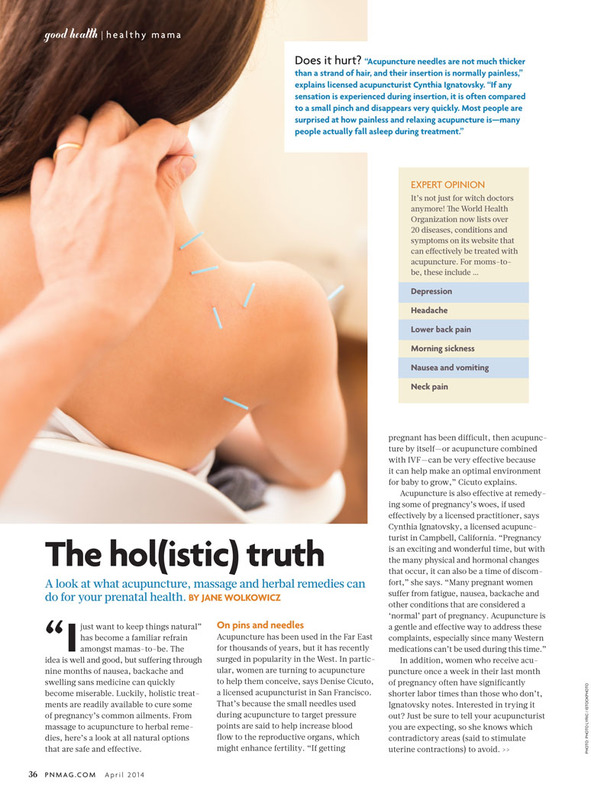 See Hol(istic) Truth by Jane Wolkowicz for more information on the role acupuncture can play during pregnancy. Moxibustion is an alternative to needle treatment of specific acupuncture points and has been used for many centuries to turn breech babies. Research is currently underway and previous scientific studies have found promising results, somewhere in the region of an 80% success rate. Pregnancy is a unique experience for each woman, our bodies are doing as nature intended and we have no control over the things that are happening – it’s wonderful, amazing and scary all at the same time – I understand that and my aim is to provide the very best treatment to help give you and your baby the best pregnancy possible.